In 2013, SOA held two conferences–the annual spring meeting and a joint fall conference held with the Ohio Local History Alliance. Scroll down for session descriptions and presentation slides. Session summaries for the spring meeting, along with some articles based on presentations, can be found in the fall 2013 newsletter. See photos of 2013’s meetings at SOA’s Flickr. The Society of Ohio Archivists held the 2013 Annual Spring Meeting on Friday, April 5, 2013 at the OCLC Lakeside Conference Center in Dublin, Ohio. 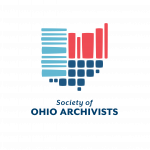 This year’s conference, Society of Ohio Archivists: 45 Years of Service to the Profession, aimed to highlight the current state of archives in Ohio, the future of Ohio archives, and the role of Ohio’s archives in the past. The plenary speaker was Raimund E. Goerler, Ph.D., Professor Emeritus at The Ohio State University. The registration fee was $40 for members, $30 for students, and $60 for non-members. Lunch was included in the cost of the conference. Advanced registration ended on March 27, 2013. Registration opened at 8:15 with the plenary at 9:00 a.m. The last session concluded at 4:15 pm. Description: This poster presents Michael DeNotto’s work with QSL cards received by Richard H. Howe, former Denison University professor and founder of the Denison University Radio Club, who laid the groundwork for the present day Denison University Radio Station, WDUB 91.1 FM, a.k.a. the Doobie. QSL cards are similar to postcards, and they are used by radio operators to confirm contact between radio stations; they are important because they provide historical and cultural context during a time when radio broadcasting was perceived as a revolutionary and burgeoning form of communication. The poster presentation will provide an overview of the QSL digital archiving process, from metadata schema to their inclusion in the Denison University Radio Station Archive which is housed in the Denison Resource Commons. Additionally, the poster presentation will discuss the curricular impact of this collection as well as the co-curatorial opportunities for students within the Denison community through the use of social media, such as Everplaces. This poster presentation will appeal to cultural institutions with radio related archives as well as those interested in facilitating discoverability and interactivity with archival holdings through social media. Description: During the fall 2012 semester, Kent State University doctoral student Shelley Blundell worked with Dr. Jodi Kearns at the Center for the History of Psychology at the University of Akron to explore information literacy as it applies to archival collections. Blundell worked with the recently donated Ludy T. Benjamin, Jr. Popular Psychology Magazine collection to practice “archival literacy,” an emerging term that describes the intersection of information literacy tasks and archival practice. Blundell created an information resource guide on adolescence for the collection, as well as a manual for continued preservation and information literacy activities for the collection. The collection contains more than 1,500 popular psychology magazines which span the late 19th, 20th, and early 21st centuries, and according to Benjamin provide a “cultural snapshot” of U.S. social history over the previous century. The poster will include images from the collection and ideas for potential archival literacy activities. This poster will be of interest to anyone who is exploring archival literacy within archival/special collections, particularly at academic institutions. Those involved with or researching the history of psychology and America’s social history may find this poster of particular interest. Description: The collection of the Henry B Fried Resource Library at the American ClockmakersâWatchmakers Institute in Harrison, Ohio, has lacked devoted attention in recent years, and its original index spreadsheet is in need of major updates. The collection includes approximately 2000 books in addition to a pamphlet collection, uncatalogued microfilm and an extensive collection of technical documents necessary for watch repair. During his internship, David L. Eichert is improving the information on the index, with the goal to make this document available to potential patrons online. Eichert is verifying the information in the index, adding additional information on each item and re-examining the order of the material on the shelves in order to overhaul the system by which the institution lends out books. Eichert’s poster shall include a sample of the materials available from the Resource Library and demonstrate how this collection is important for the future research of both professionals and enthusiasts for the clock and watch trade. SOA attendees will find interest in the important place the American Watchmaker’s and Clockmaker’s Institute has for this state and for the nation. It is an important reminder of the former prominence of horology in American industry. Description: For her culminating experience for a Master of Library and Information Science from Kent State University, Michelle Brasseur completed a practicum with the Denison University Library in Granville, OH, digitizing their Women’s Studies Department’s archives. This project required the use of archival scanning and metadata creation to expand the Women’s Studies collection “Looking Back, Looking Forward” found in Denison’s Digital Resource Commons. Presentation software was used to create a digital narrative and timeline of the Women’s Studies Department at Denison. Collection materials for women students date back to 1937, but a majority of the collection focuses on the achievements and changes in the Women’s Studies department throughout the late 1970s and 1980s. Women’s Studies newsletters, beginning 1978, show changes in the interests of students and faculty throughout the years. This project will be of interest to SOA attendees as it addresses preservation and organization issues and tracks the process and procedures used in the growth of this collection. The Society of American Archivists began the “I Found It in the Archives” contest in 2006 to show how documents preserved in archives are used and appreciated by researchers. Have you run the contest in your repository? Find out about the nuts and bolts of how to do it from OHS staff. Do you have ideas about how to recruit more participants? Are there ways that archivists can utilize the information gathered during the contest to promote our collections and services to a broader audience? Can contest data demonstrate the value of archives to donors and funders? Put on your thinking caps! The floor will be open for discussion. This session will offer practical advice and direction on maximizing our archival roles on a global basis. As archivists, whether we work in college and university settings or in local and regional historical societies, we are aware of collections that have importance beyond the interests of our regular clientele. We are also aware that as archival professionals, we respond to the needs of an ever-expanding field of researchers. In short, the world stands at our archival doorstep. But how do we put out a proper welcome mat and open the door? This session addresses that question in two parts. In terms of “Collections,” we have EADs, which are tremendously effective in promoting our holdings with concise finding aids. However, we can move beyond this by getting involved with current developments in Massive Open Online Courses (MOOCs), by providing direction and content for study abroad curricula, and by establishing key reference assistance to institutions abroad that benefit from access to our primary source documents otherwise unavailable to them. And, in “Professional Development,” this session will also provide guideposts to effective participation in international forums, and, how we can maximize our growth as archivists in a global environment that will increase our value in the workplace. Representatives of the Ohio Historical Records Advisory Board, which serves Ohio “…by advocating, nurturing, and advising programs that identify, preserve, and provide access to their documentary heritage…” will discuss the variety of services OHRAB provides, including grant support and recognition, specifically focusing on the OHRAB Achievement Award that can be a useful tool to promote an institution and its holdings. Two recent winners will share their experiences. The Licking County Records and Archives Department, a 2011 awardee for salvaging and preserving historic county records, has created and administers the Records’ Keepers Roundtable, a group of county staffers assigned to records management within their departments, and an extension of an initiative to create a full-fledged records and archives program begun in 2008. The award helped to spur support for the program from their Board of Commissioners, leading to a dedicated county records center. 2012 awardee Euclid Public Library is using the web to document and increase access to its cityâs history with a broad range of sources, which includes recordings of City Council meetings, oral histories, residentsâ family photos, brochures about various aspects of Euclidâs history, Euclid High School yearbooks, and the Sun Journal newspaper. All of which makes the Library a principal resource for the history and culture of Euclid. This presentation is a discussion on the first stages of a preservation needs survey/assessment of the University Archives, located at Miami University. Currently, the archive suffers from several problems that need to be addressed, including environmental instability issues, as well as a lack of documented policies and procedures. The Preservation Librarian will discuss the assessment process, including working with the University Archivist and staff to perform preservation assessments of the current Archives’ space, storage and housing, handling and use policies, disaster preparedness policies, and the general condition of materials. The presentation will go on to discuss how to use these assessments to identify problem areas, and finally, to propose ways to fix/improve current problem areas through new policies and guidelines, preservation planning, collaboration between university departments and seeking out funding sources and grants. This presentation relates to the theme of this year’s conference by addressing both the current state of archives in Ohio and the preservation and maintenance of materials. This session illustrates the collaborative, multi-format approach used in preparing an exhibit of archival materials on the 1913 Dayton flood at the University of Dayton Libraries. Originally formed due to the absence of a University Archivist, the small planning committee was able to combine areas of expertise including archives, history, graphic design, video/audio production, marketing, and digitization. The collaborative process facilitated a creative approach resulting in a unique, interactive exhibit utilizing audio, video, original materials, reproductions, a permanent digital component, and a discussion panel event. The session will also cover how the planning committee maximized available resources (without a budget) to expand marketing and outreach efforts with other departments on campus, thereby gaining visibility at the University and the Dayton community. The session will provide valuable information for archivists who exhibit materials from their collections and are seeking new ways to maximize the impact of their exhibits. The session will inspire conversations on ways that archivists can think creatively about displaying materials from their collections and identify opportunities for collaboration in both planning and marketing efforts. Digitization projects continue to grow in popularity as institutions seek to provide increased access to their special collections while preserving their original materials. Come to this session to learn about the three institutions’ digitization projects, including their successes, challenges and collaborations, and how their experiences can help you prepare for your own digitization projects. Kim Tully and Elias Tzoc of Miami University will describe their project to digitize Civil War manuscripts and discuss collaborations between special collections and digital initiatives. Angela Vanderbilt of the University of Cincinnati will talk about the joint efforts of the Archives & Rare Books Library and Digital Projects Department to digitize photographic prints and negatives (nitrate and acetate) from the Cincinnati Subway and Street Improvements Collection. Jenni Salamon of the Ohio Historical Society will discuss the National Digital Newspaper Program in Ohio, a large scale, collaborative newspaper digitization effort.